To print a PDF copy of the presentation above, click here. In November and December 2017, the Foundation discussed the survey as part of our effort to help set the focus of its future Unrestricted Funds grant making. 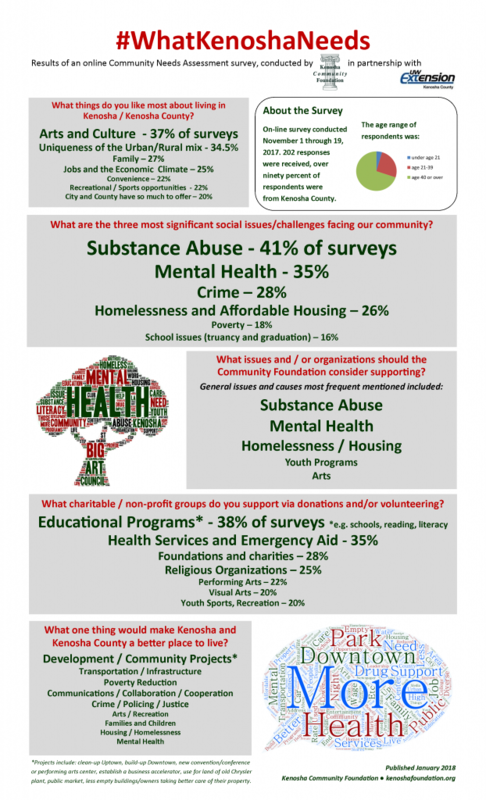 The Foundation will share results with the community via social media and at THE Foundation’s Annual Public Meeting on January 24, 2018 at the Southwest Branch of the Kenosha Public Library – contact email@kenoshafoundation.org to RSVP. The Foundation will share and discuss results of the survey with other stakeholders / donors – city, county, United Way, etc. – to identify any opportunities for collaboration. As reported in the Kenosha News, January 4, 2018.